In "RoboCop," Detroit police officer Alex Murphy is gravely injured and then rebuilt as an unstoppable cyborg. And while the story seemed like impossible science fiction when the original film was released in 1987, the upcoming new version comes to a world where the technology is not that far off. As demonstrated and explained in this exclusive featurette, "Man and Machine," humanity and machinery are already in cahoots. 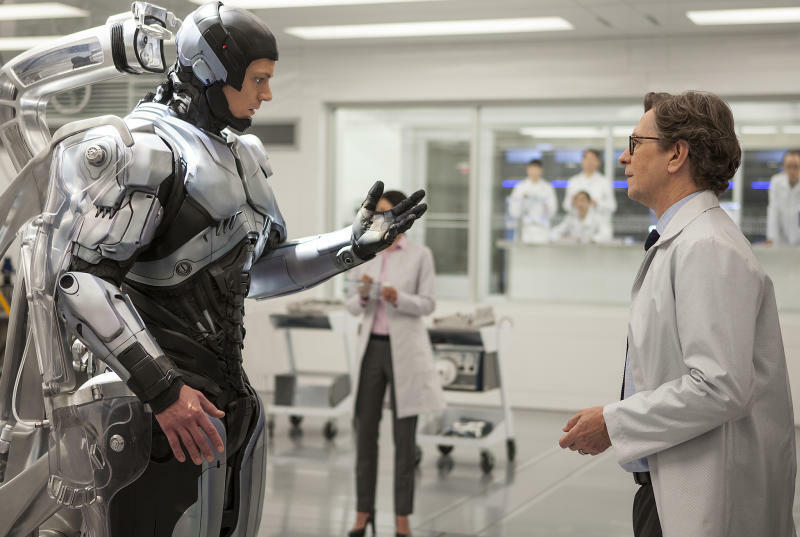 "The premise of 'RoboCop' embodies all of the questions that have to do with machines taking over," said director José Padilha. "In reality we're very close to many of the things in the movie right now," added star Joel Kinnaman. "It's not some crazy futuristic vision." For examples of these future-is-now examples you need look no further than branches of the military which have been approved to conduct drone testing, or at the work that the University of Pittsburgh School of Medicine is doing with robotics to help people living with paraplegia. Their "brain-computer interface" technology is allowing people who have no use of their own limbs to move robotic arms using just their minds. So how far are we really from putting someone in a fully robotic suit? Come back to Yahoo Movies tomorrow for the second half of the "Man and Machine" featurette. "RoboCop" opens in theaters February 12.